The ingredients that you should need are very simple and the list is not so long either. You will need 200 gram of plain flour, 2 eggs, a pinch of salt and some drops of olive oil. For the eggs, you can put in2 whole eggs or 2 yolks depending on your preference. Putting the whole eggs into the batch will provide you more proteins while the yolks will bring more flavors to your pasta. After that, you can mix the batch by hand or use a blender. While mixing, you should add oil and salt into this mix. When everything is mixed thoroughly, you should take the batch out and press to make dough. Make sure that the dough is not too wet and not too dry before processing the dough into the pasta maker. Roll the pasta maker slowly until all of the pasta come out totally. Also sprinkle some more flour onto the uncooked pasta for more texture. In the last step, you can boil some water in a pan and pour all of the pasta inside and cook until the pasta is tender. Let the pasta dry completely before you serve or cook with other sauce. Although egg pasta can go great with any flour, but you should remember that the heating and boiling time of each kind of flour will be different due to the different in their kinds and ages. So you need to check carefully and frequently while cooking your pasta to prevent them from being undercooked and overcooked. The quantity of other ingredients also varies according to different kinds of flour. You should not follow the recipe so strictly. If you think that the dough is so sticky, add more flour. If you feel that the dough, on the opposite, is too dry, add more oil. And if you see the color of the dough is slightly whiter than you expect, add more eggs. Don’t feel afraid when you have to change one or 2 things in your recipe. You will get better sooner or later. You should let your pasta drain completely after putting it into sauce. There are also many other different ways and ingredients to add to your pasta which you can try to enhance its flavors. 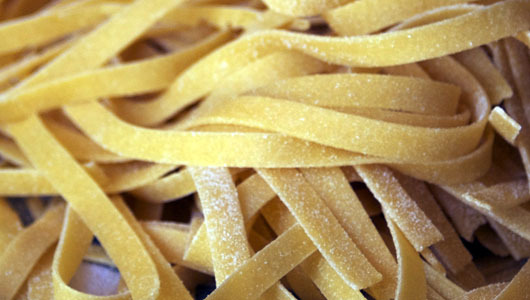 Here are the basic steps as well as some tips to help you make fresh egg pasta. You can see that making it is very easy and does not take many ingredients as well as much time. I hope that with this article, you will be able to cook the best pasta and continue to make more delicious dishes with pasta in the future.